A trip to the U-Pull-It yard can be an adventure. Every once in a while, wandering amongst the rabble, you might stumble upon a longtime crush or a car that should have had a better fate. Let’s take a look at some of those. Like Disneyland is for the youths, the U-Pull-It wrecking yard is my happiest place on earth. I recently made a trek out to one of the yards closest to me—and within spitting distance to the Irwindale Speedway—nominally to yank some cooling system parts for my old Audi. Of course, you can’t go to the yard without taking a grand tour and seeing what all is there. After all there might be gold in them thar rows. Here are a few cars that I felt were the yard’s least deserving inhabitants. You can weigh in on my choices in the poll at the end. Okay, I have had an unnatural attraction to the X1/9 since long before I can even remember. 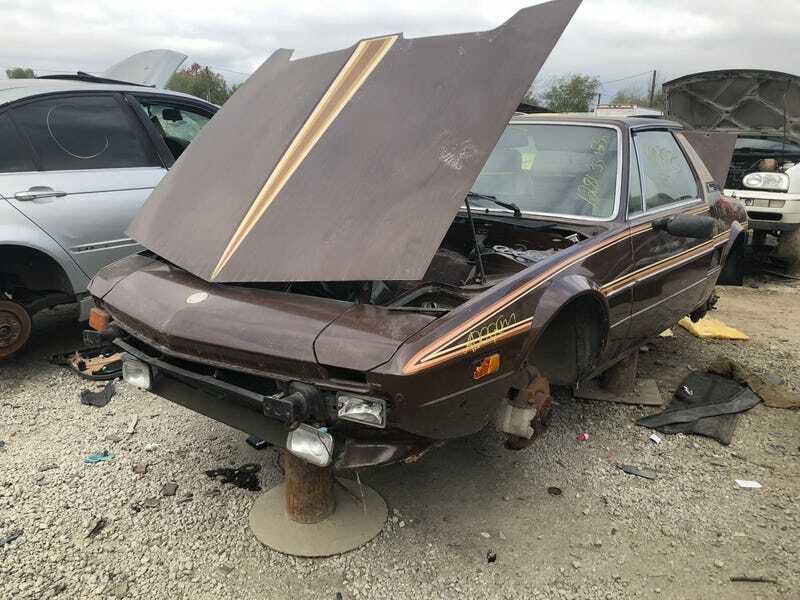 The little mid-engine miracle was a Bertone design and was sold here from ‘74 to ‘81 by Fiat and then from ‘82 to ‘89 under the design house’s own brand. That latter phase was with the guidance of none other than Malcolm Bricklin. Its whole story is just kind of improbable. Over that time and ever since, I’ve wanted one. This 1979 X1/9 sports a perfect body and even decent paint if you can get past the ‘70s orange and brown color scheme. It looks like it has lost its tail lights, instrument cluster, tiller, and three of its steel wheels to the pickers in the yard, but its denuding is far from complete. Sadly, it looks like it might have even been a runner when it came into the yard. The engine bay shows no indication of significant disassembly nor major catastrophe. All the glass is intact, as is the targa top. The car also sports what look to be some aftermarket (or at least dealer-installed) power windows and some pretty boss Pioneer speakers. Why was this seemingly sweet little Fiat so ingloriously cast off? Audi developed the Ur-A8 with the help of ALCOA, the beer can kings. Together they designed an innovative aluminum unibody that allowed the A8 to weigh in below or near its Mercedes S-Class and BMW 7 Series competitors despite sporting Audi’s hefty Quattro all-wheel drive system. That combination seemingly couldn’t keep this silver over black 4.2 V8 model from its date with destiny. There’s no body damage on the car so whatever fatal malady that doomed it to the yard must have been either mechanical or maybe financial—sometimes cars with unpaid registration or fines find their way here. You’ll find the roomy interior to be just as luxurious and inviting here as when it was a big dog on the road. You’ll also find however, a milk jug that’s quarter-full of pee. I don’t know why it is but every time I go to the junkyard I invariably come across a car with a pee jug. It’s gross, but also somehow magical, like finding an easter egg. I thought about grabbing the Concert Stereo head unit from this car for my Audi, but then remembered that they are code-protected and the manual for this car—which might have contained that code—was missing. A lot of people forget that Porsche continued the 924 long after they introduced the far more Porsche-esque 944. Production of the 924 extended for so long that it actually outlived the van motor that originally called its engine bay home. In 1986 Porsche created the 924S, which carried a 150-horse edition of the 944's 2.5-liter four. That was about the only bit from the 944 that the S received, as it carried on with the ancient 924's interior and its narrow bodywork. This one’s body is even narrower by way of a nasty shunt, and that old school interior has been fed upon in the yard. The engine, amazingly, still looks relatively complete. This car has an automatic in its transaxle, so maybe its fate was actually deserved. Hell, maybe the shunt that eff’d up the fender and broke the front phone dial was on purpose! Why don’t we get small sporty cars with T-tops anymore? I think that’s an important question to ask. We once had such a car from Nissan, the amazing Pulsar NX. When that car was replaced, it lost the Pulsar name here in the U.S. as well as that model’s cool pop-up headlights—not to mention its wacky modular setup. What the succeeding NX 1600/2000 did keep was the T-roof and somewhat underwhelming albeit fuel efficient Sentra-sourced underpinnings. You almost never see these cars anymore, not even in the wrecking yards. This one was fairly picked over, and it looked like the surface rust around the hatch was about to get nasty. Does anyone love these cars anymore? Did anyone ever? Speaking of cars you never see in the yards anymore, here’s a first generation Honda Accord. These have all mostly already cycled through the junkyards so this silver over red example is a straggler. The three-door hatch represents the first generation’s facelift, which featured updated bumpers, grille, and tail lamps. Honda also substituted a three-speed automatic for the two-speed on these, which improved both the drivability and fuel economy. Of course neither of those factors apply to this one now. The 1.8-lite four here has been denuded of a number of parts, however I’m still impressed by what’s left of just how many vacuum lines Honda felt this engine needed to run right. I think it’s also noteworthy that on this generation of Honda, the engine dresses left. The current Honda Accord is a very nice car, but be honest, wouldn’t you rather have something as simple and honest as this? No, you like all the current safety and performance capabilities of the modern edition? Well okay then, be that way. These were the cars that, on my most recent run to the yard, really tugged on my heartstrings. I was super sorry to see these cars meet such an untimely fate and now I want to know if you feel the same way. Vote below for the junkyard car in this list you are most sorry to see go. Let me know in the comments what your most amazing yard find has been.